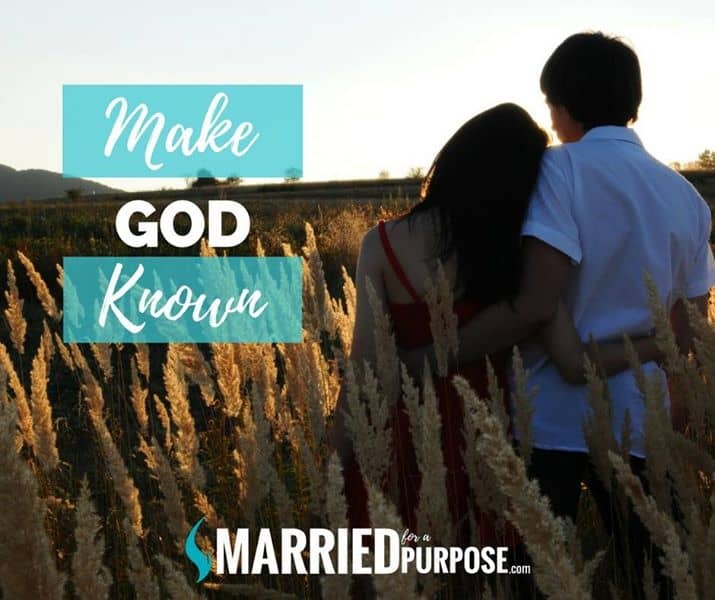 This week, take a moment to read Matthew 5:14–16 and consider ways you can make GOD known in your life and marriage. As a couple, the highest compliment we experience occurs when our children say, “We see Jesus in you.” Or, “I feel His love when I’m with you.” Wow. What a feeling. As a spouse (or parent), one of the best ways to cultivate new habits of thinking so we experience a higher way of liv­ing is by daily asking, “How can we make God known (most naturally) in our home?” After all, the greatest opportunity to make God known begins within our family relationships. True, God calls us to make Him known through our random acts of kindness, by extending encouragement or benevolence to outsiders, or even by offering gentle responses to people we encounter day to day. But those same habits of extending God’s love should first be extended to each other. We welcome a higher way of living for our marriage when we daily purpose to make God known in our words and actions to each other in the privacy of our own homes. Can you imagine how much our relationships would thrive if we as a couple determined one way each day to concentrate on making Him known within the four walls of our home? Can you imagine how much we could impact our culture and future generations if every morning before our feet hit the floor, we invited God to reveal one way we could make Him known to our spouse and to our children? ° Discuss how Matthew 5:14–16 applies to you as a couple. ° Discuss a few ways you can add value to each other and to your children this week. Then do it! ° When you wake up each morning this week, say a short prayer, asking the Lord how He wants you to make God known through your words and actions to each other and your children. Father, remind us to make you known in the way we respond, in the actions we take, and in the way we treat each other. We want to live full-on into your purpose, in a way that pleases you both practically and spiritually.